Tivoli, the ancient Tibur Superbum, as it was called by the Latin poet Virgil, is situated on the slopes of the Monti Tiburtini, hills to the east of Rome. 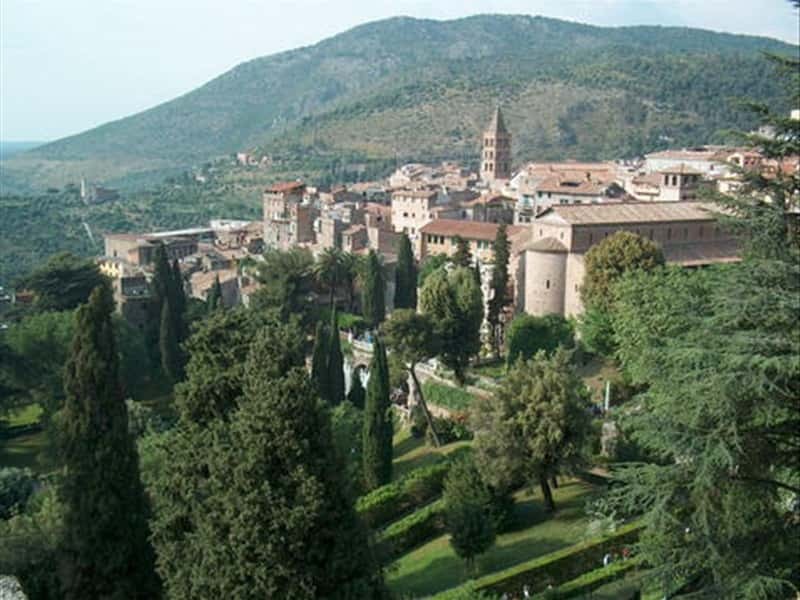 Tivoli has been famous for its mild climate and charming vegetation since ancient Roman days, and even though it is a small town, it boasts two entries on UNESCO's World Heritage List: the 16th century Villa D'Este and Villa Adriana, a Roman architectural complex. As early as the Roman period this was a favourite spot to get away from the summer heat in the city: Sallust, Catullus, Horace and Maecenas were some of the famous figures who passed the summer months here. The Roman aristocracy later built sumptuous villas here in the 16th century. These nobles competed in magnificence and imagination to create both the buildings and gardens. The most famous monument of the city is Villa d'Este, built in the 16th century on the structure of a Benedictine monastery for Cardinal Ippolito II d'Este, the son of Lucrezia Borgia and Alfonso I d'Este. The villa is famous for its artistic wonders, including frescoes from the 16th century Roman school, but above all for its Italian gardens, which are astonishing with their charming performance of water games and sounds and its fountains, fed by the Aniene River through a pipe which passes under the historic centre of the town. The Organ Fountain and Bird Fountain have just started to play music again, after being silent for more than two centuries: The Organ Fountain plays four Renaissance era songs; the Bird Fountain plays bird songs. The other famous fountains include the Bicchierone fountain, attributed to Bernini, and Rometta Fountain, a miniature reproduction of monuments of Classical Rome. Another treasure in Tivoli is the garden of Villa Gregoriana, located below the ancient acropolis, where in the midst of grottos and woods, it is possible to see the remains of some Roman temples, including the round Temple of Vesta (which contains 10 of the original 18 Corinthian fluted columns dating back to the second century BC) and Sibyl's Temple, from the second century BC, both transformed into churches in the Middle Ages. From the terraces of Villa Gregoriana it is possible to see the Great Cascade with the water plunging down with an evocative roar from a height of 160 metres. Another historical sight in Tivoli is the Duomo, completely renovated in Baroque style in 1635, but which conserves the original bell tower from the Romanesque building. The Mensa Ponderaria, the weights and measurements office in ancient Rome, still has its weights, marble tables with measures of capacity and two counters with the various samples. Rocca Pia is interesting; it is an impressive square fortress built by Pius II, next to the amphitheatre of Bleso, which was home to gladiator games during the Imperial epoch. Rivalling the pomp and uniqueness of Villa d'Este is the other masterpiece of architecture and urban planning: Villa Adriana, positioned in the valley under the town, is the largest of the Imperial Roman villas. Legend has it that it was the same Emperor Hadrian to design his residence based on the structures typical of the eastern provinces of the Empire. The massive dimensions combine with the pomp of the furniture and decor; many of the works found during archaeological digs, including the four Caryatids standing over 2 metres in height, are on display in the nearby Museum. More than a villa, the complex is a series of gardens and buildings, including theatres, libraries and baths, which with their harmony create an almost unique example of late Hellenistic culture in the world. The Maritime Theatre, Great and Small (probably once only for women) Baths, Canopus, an artificial valley which attempts to recreate the Egyptian city of Canope, the Imperial Palace, most likely the Emperor's winter residence, which covers 50,000 square metres and the Greek Theatre should be visited. A visit to Tivoli would not be complete without a stroll through the town which, starting from Via Campitelli, one of the most typical streets of the town with late Medieval houses, leads to San Pietro alla Carità, a church founded at the end of the 5th century probably by Pope Symmachus. Via del Colle and Vicolo dei Ferri are also charming where it is possible to see numerous towers and the church of Santo Stefano from the 11th-12th century, deconsecrated in 1872 and transformed into a theatre and home. The 13th century church of Santa Maria Maggiore is also worth a visit. It contains a late Gothic portal with rose window and 14th century triptych by Bartolomeo da Siena and the Romanesque church of San Silvestro with its wonderful 13th century frescoes. This town web page has been visited 37,598 times.